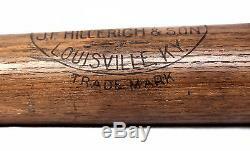 Hillerich and Son Baseball bat. Beautiful full size thick handle bat. The bat weighs 37-38 ounces and is 36 inches long. This is one of the earliest J. Hillerich and Son (Hillerich and Bradsby Louisville Slugger) bat that came out of the factory in the 1900s. 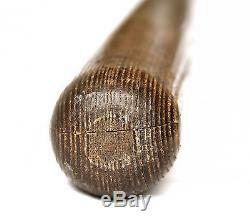 The bat for sale is in near mint condition. The logo is nice and bold. There are just a few white marks and black couple of dark spots on the bat. There is slight wood checking on top of the barrel and on the end of the knob. Ultra rare bat, a true museum worthy piece. Just got a collection of unique generic turn of the century Hillerich and Bradsby baseball bats and player endorsed store bats from an estate in the midwest. I will be auctioning a few this week and the rest in a couple of weeks. 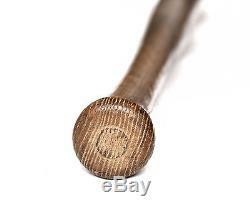 The item "Vintage 1905-1910 J. Hillerich and Son Baseball bat Near MINT, Uncracked" is in sale since Sunday, January 15, 2017. This item is in the category "Sports Mem, Cards & Fan Shop\Vintage Sports Memorabilia\Bats". The seller is "sports_memorabilia_collectibles" and is located in New York, New York. This item can be shipped worldwide.